The Big Four’s Legal Arms: Modest Ambitions Curtailed? It’s not legaltech but the Big Four that is disrupting the legal services market. Some think so. It’s been a week since Deloitte got licensed to provide legal services in the UK. Four years back, PwC, EY, and KPMG got licensed as well. So, they got their small piece of the legal pie. Now they say they don’t want any more of it. They are so modest, aren’t they? Let’s not talk about who’s to blame for disrupting the legal services market, the Big Four or legaltech. One thing is clear though – the global legal services market is being disrupted by the British. It started in 2007 when the UK Parliament passed the Legal Services Act and weakened lawyers’ monopoly on the local legal services market. Non-lawyers got permission to own and invest in legal firms within the Alternative Business Structure framework. Starting from 2011, any company that has non-lawyers in its cap table could get licensed to provide legal services. Since then, 782 companies, including all the Big Four accounting firms, got licenses. The global legal services market is valued at about $600 billion, which makes it four times bigger than the audit market. But here’s the thing. 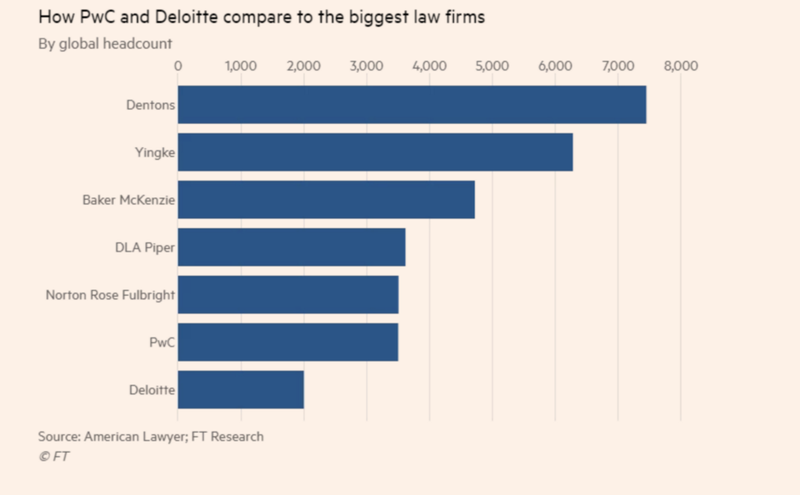 The Big Four firms have 23% of the audit market, while the legal services market is way more diverse, with the top 100 law firms taking only 13% of the global legal services pie. The chart above clearly illustrates that the Big Four firms are indeed very big. KPMG, the smallest among them, is almost ten times bigger than Kirkland & Ellis, the law firm with the biggest cash flows ($3.1 billion). PwC earned as much as $500 million from legal services in 2016, coming 78th revenue-wise among the global top 100 law firms. In 2016, Deloitte earned only $250 million, so it didn’t make it to the top 100 revenue-wise. However, the revenues from the Big Four’s legal arms (I’d rather call them legal tentacles; however, the Financial Times calls them arms) are growing some 10% every year. The top law firms grow way slower. It appears that Deloitte’s revenue per lawyer is some $125K ($250 million revenue/2K lawyers). It’s a little bit bigger at PwC: $142K ($500 million revenue/3.5K lawyers). It appears that the Big Four is either a bottom feeder or it is simply inefficient. The latter is very unlikely: those guys know how to manage business processes and financial efficiency. So, either it’s bottom feeding, or you continue reading. What will the Big Four be doing in Britain? PwC were the first to get the ABS license in 2014, followed by KPMG and EY. Deloitte joined them only in June 2018. “There is room [in the market] for a lot of players and our competitors in the big four are already operating in this space”. 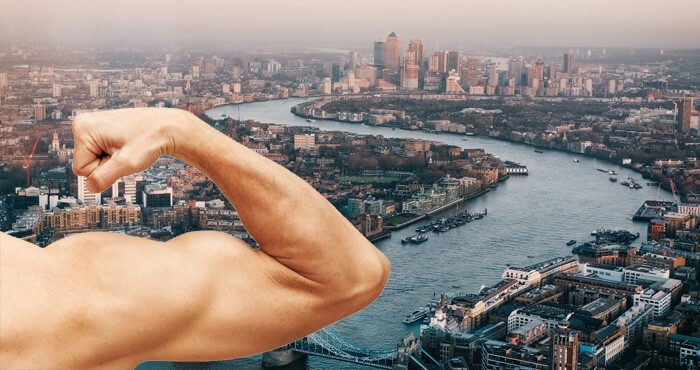 According to press releases, the Big Four are considering two options in the UK: going full-scale with legal services or focusing only on practice areas that deal with their consulting arms. I know you are growing tired of my illustrations. But look at the Big Four’s expansion in the consulting market. They’ve been slowly but surely moving into practice areas traditionally associated with McKinsey and Boston Consulting Group. I’m sure they’re planning on doing the same with legal services. It is no wonder, though, that he says things like that. In 2016, KPMG earned only 12 million GBP from legal services in Britain (against 10 million GBP in 2014), while PwC earned 60 million in 2016 (against 49 million in 2014). Deloitte’s business developers turned out to be a little bit more creative when talking about their market positioning strategy, with Matt Ellis saying they are going to take work from law firms by using automation tools. If none of the Big Four firms is going to build a standalone law firm, then where are they getting their money from? Immigration and labor issues, corporate management, tax disputes, lawsuits against the government, IP, and real estate. In addition, Deloitte sells contract management and corporate records management tools. And here’s why the revenue per lawyer at the Big Four is quite low. These guys do not engage in high margin practice areas, such as arbitration or M&A. Sure thing, the Big Four firms deal with М&А legal issues, but they sell these services together with financial and tax consulting, and that’s why their lawyers’ rates are way lower than top law firms lawyers’ rates. The Big Four firms have been providing legal services for 25 years. In 2014, they obviously started pumping up their legal arms. Although they don’t speak openly about it, they are definitely going to expand their services. This looks like a threat to law firms…. Except for a tiny obstacle called Carillion. Imagine yourself as some entity as huge as PrivatBank, the largest bank in Ukraine, but scale it up to a multi-national corporation. In January 2018, Carillion, a British conglomerate audited by KPMG and Deloitte for the last 19 years, went bankrupt. However, not only the auditors were caught up in the whole mess. PwC and EY also provided consulting services to Carillion. Carillion’s bankruptcy made British lawmakers wonder how such a f*ck-up could ever happen. They seemed like highly qualified auditors, those big-brained nerdy-looking guys and girls sitting in open space offices. And yet they failed. They will be forced to spin off their consulting arms into separate businesses. Financial Times reporters say, without disclosing their sources, that Grant Thornton and BDO are excited about and absolutely supportive of either plan. I have no idea what lawyers are going to get out of this forced spinoff. On the one hand, they will finally get thousands of “consulting clients” they were unable to get. On the other hand, if the big-brained guys from the Big Four knew they would benefit from spinning off their legal arms, they would have done it long ago. The Big Four wants to climb the greasy legal services ladder. But they aren’t there just yet. The US legal services market is still closed. Plus, there is this Carillion scandal in the UK. So, the Big Four won’t be causing any distress for top law firms in the immediate future. However, leading law firms (except those in the US and UK) should start worrying. This is especially true for our Ukrainian legal services land of milk and honey. 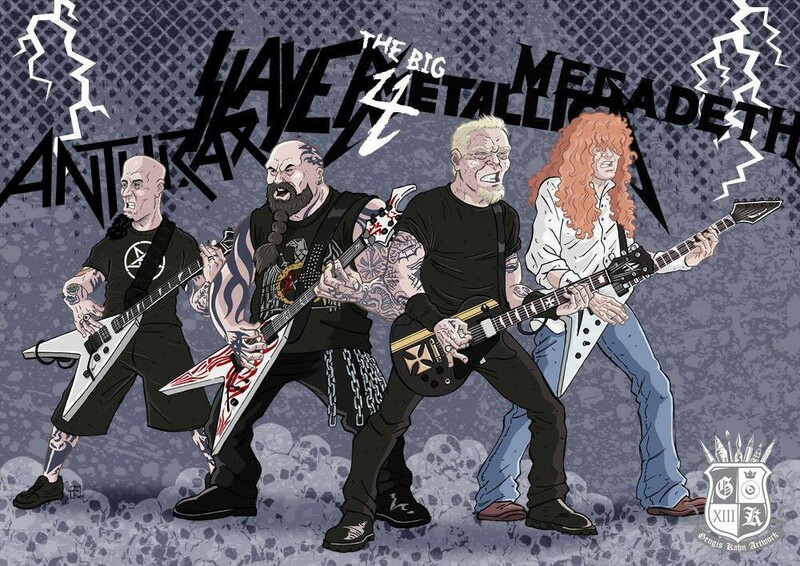 The Big Four will simply swallow law firms alive. First of all, there’s no chance law firms can withstand such an assault because of commoditization (aka legaltech). I talked about what was actually wrong with innovations and legaltech in Ukrainian law firms in my recent article. Second of all, there is this bottom feeding. Mid-tier and small law firms should fear neither legaltech nor the Big Four. They should fear financial and telecom giants hitting the market. I am going to wrap it up now with a killer joke. Am I Evil? The Big Four recorded this live video with a title that speaks for itself in 2014, when KPMG, PwC, and EY started practicing law in the UK.